Hey all, I’m Andrew Veen. 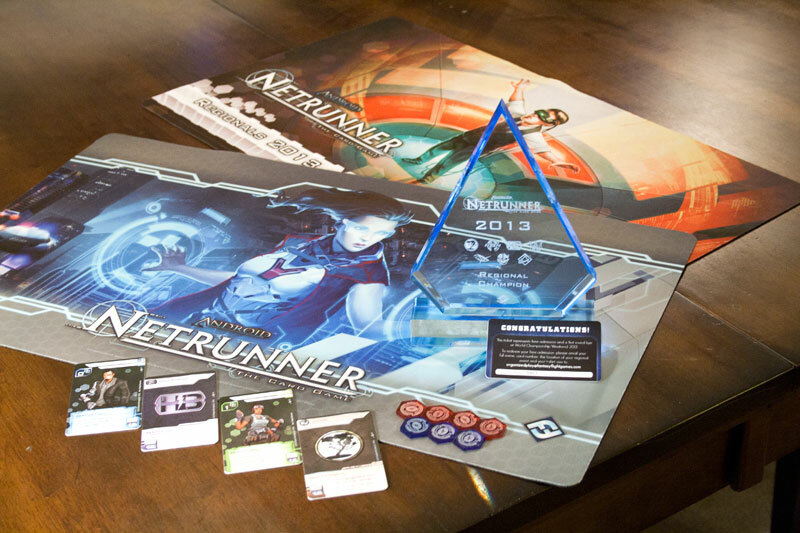 I won the Seattle Netrunner regionals. I haven’t written a tournament report in a long time, and my notes from the weekend were sparse*, but the rad dudes at stimhack.com have been awesome and I wanted to get something up to share my thoughts on regionals and the meta in general. Riley Scott and Ian Hall for being excellent playtest partners. Without them, I would not have been as prepared to compete. Aaron Michelson for coming up with our version of HB almost card-for-card on his first pass at the list. Jeremy “Prunesquallor” York and Uncle’s Games for hosting the event. Jeremy has done more for Seattle Netrunner than anyone else, period. If it weren’t for his dedication to organizing and running great events, our meta would not be nearly as competitive. FFG for resurrecting my favorite dead CCG after a 15 year hiatus. I can’t believe I got to cash in on my love of dead card games. Our group made a few assumptions about the evolving metagame while testing. First, we thought that the corp was a huge dog to the runner, across the board. As such, we expected to win our runner games with a slightly modified and updated Gabe and just wanted to score as many points as possible as corp. Originally, we were looking at the new NBN as the list that would get us the most points the fastest. I think that deck is still viable, and I think the tagstorm variant with Midseason Replacements, Psychographics, and Project Beale (as Making News) is also quite good, but inconsistent. It’s too bad, as that deck is absurdly fun to play. We also tried really hard to abuse Oversight AI (that card is way too good). Once we decided that we were going to rely on fast advance (a sharp turn for us, as most of my previous tournament success was based on a straightforward Weyland strategy that was equal parts find-and-explode-their-apartment and advancing the “fair” way), we started looking at what to expect. From the runner side, we expected to face a lot of Criminals, mostly aggro Gabe with a smattering of link Andromeda. As Alexfrog commented in his review of Future Proof, Noiseshop didn’t really get anything exciting to add to the deck, and we thought the presence of Midseason and the threat of Flytrap NBN made stacking resources on Personal Workshop too risky. Knowing this, we knew that Emergency Shutdown and Account Siphon were the most relevant threats, and we knew that we needed a lot of early cheap ICE for the standard Inside Job/Sneakdoor Beta package. Aaron’s first crack at HB was the list you see here with a third SanSan, no Chum, and 2 Archived Memories. We settled on zero neutral ICE. Yog.0 makes Enigma blank in most circumstances, and Wall of Static costs 3 and can’t be advanced. Femme Fatale and Corroder are the most common answers to Barriers currently. Ice Wall deals with Corroder on Central Servers, making it prohibitively expensive to run repeatedly, and Chum in front of whatever the runner targets with Femme is incredible. Chum is also excellent with Pop-Up Window and Viper. Chum/Pop-Up is a total rez cost of 1 (net 0) and is a legitimate threat/tax until they can dig for a Decoder. The Asset package is for the obvious economic and advancement benefits, but also provides counterplay for incoming Account Siphons. If the runner Siphons when the corp is holding 11 credits, those credits can become SanSan and Eve during the rez window after the last piece of ICE, leaving the runner the option to merely access a card in hand rather than cause a 15 credit swing. Still painful, leaving the corp without the ability to rez ICE for the rest of the turn (and likely the following turn), but is still a very potent play. We also didn’t play Melange Mining Corp. Melange is fantastic and belongs in many decks. We didn’t include it in this deck for a few reasons. It’s too fragile, requires defense, doesn’t defend against Siphon like expensive assets, and it is click intensive. Additionally, we expected a lot of R&D Interface, and general R&D pressure, since we were going to score a lot from hand. Melange can just be trashed for 1 from R&D, preventing you from getting the income and letting them see another card on the next run. The runner changes were riskier, but paid off. We scrutinized literally every slot in this deck. We considered cutting Inside Job at one point. In the end, we cut Yog.0 (and Vamp for the influence) from our previous list to make room for Gordian Blade in case the rest of the meta jumped off of Enigma train onto the Viper bus with us. We also didn’t want to continue to take Chum subroutines on the chin, fighting whatever was behind it at +2 strength and free katana. We also cut Special Order in favor of Quality Time, because we are greedy and never liked spending a click to go get one card when we can get five. On the safe side, we left in Shutdown to fight against Oversight, left the Plascretes in to avoid having to stop the party to pop some tags, and added 2 E3 once we realized HB was the deck-to-beat and Eli was a rock solid pimp at the tender age of 12. Despite planning to take myself and 6-7 other people to this event, I ended up only having Ian from the playgroup show up. The other losers I tested with decided to go get married, or that requiring sleeves was a bridge too far, or that going outside to experience nature and party at the Solstice festival would be more fun. SO BE IT, NERDS. Once I got there (and spent ~30 min trying to park at the mall in downtown Bellevue on a Saturday) I found the venue and signed up. I was shocked at the prize support. In addition to the baller kit that comes from FFG, Uncle’s had ponied up a full spread of expansions and a Game Night kit to sweeten the pot. Ian found me and told me I needed to get a decklist turned in to Jeremy. Luckily, he had turned in his list, so I just got to say “put my name on that, too.” I had a brief scare when it was almost time for the first round to start and I realized that my deck was still behind our last change (PSF for Corporate War). We went back and forth on that in testing, finally deciding to stick with PSF to punish Criminals for ignoring tags against HB while discarding “unnecessary” Plascretes. Also, going broke after running out a Corp War with only 5 or 6 credits left is not a good feeling. Luckily, Ian had a full set of PSF handy for me to switch in. Round 1 gets paired, people start heading to their seats, and a newly registered player walks up. The easy solution was to award that player a bye for the first round. This appeals to my TO and judge sensibilities, but does not sit well with my player instincts. I complain to Jeremy, instead suggesting that he repair and assign the bye randomly. I feel like a jerk for inflicting more work on him, but there is a murmur of approval from the players. My round 1 opponent is Brendan B. Brendan is packing Jinteki/Gabe. I run first. I get a good start, Sneakdoor and Quality Time in the opening hand. Turns out the Sneakdoor wasn’t necessary since he didn’t defend any centrals. He plays the Jinteki shell game with 3 remotes while I score 7 from his deck and hand. I got snared in both zones, which I think he was relying on as his defense, but I always had an outrageous hand size since I was drawing and I didn’t need to install anything. He is pretty impressed with my play, which was not anything special, but I don’t think he is used to seeing aggressive running from the people he plays with. He says that his Gabe is less impressive and that he is excited to finish out the day and make some changes to his deck. His spin as the latino lover in blue goes less well. His only program for the early turns is Snitch, which he uses to run on every face down ICE (to his credit). His default play is to Snitch the ICE, then jack out if he doesn’t have the breaker, even if the only subroutine is end the run on Ice Wall. I tell him that he can opt to stay jacked in and make me pay the rez cost to have the same net effect (the run would be over), but he assures me that he likes to play it safe. My round 2 opponent is Conrad S. Conrad is playing Weyland/Gabe. I am corp first. I don’t remember very many details about this game, but I do remember that I was quite pleased with the performance of the deck. He played Ninja off the back of Special Order early after landing a Sneakdoor Beta. I ice up the centrals and start going to town on advancing in a SanSan remote. He grabs a few points late in the game, but by then I’m gripping 2 Biotics and rolling in dough. He shuffles up his Weyland and I switch to Los Gabrialos. He Oversights some heavy hitters in front of HQ and a remote, but Quality Time finds me an unlocked back door and some emergency canine heart stoppers. His remote was hiding Gov’t Contracts. I land 2 Plascretes to make sure that when I start Siphoning he will have to blow up the whole city block to get me, and the game falls my way. After the game, he asks about the differences between my runner list and his and I’m impressed by how quickly he gets our thinking behind the list. Overall, my impression of this kid is wildly positive. He played well, was quick, was nice, and is obviously a smart cookie***. My round 3 opponent is Anthony Roybal. Anthony and I are sitting at 12 prestige. I have seen Anthony at tournaments previous and have encountered him online in various online locations. He is an excellent player from the Ernie’s playgroup in Woodinville. We both know that this round will be difficult and we both want the 6 prestige. Anthony and I will meet up again in the semifinals. Anthony is playing Andromeda/HB. I don’t remember the order of our games in the Swiss rounds, and I have a spotty recollection of the events of the games. I remember that they were close. As Gabe, I know that I got denied early access to centrals and that he landed 3 SanSans throughout the game. This is despite mulliganing to a 1 ice hand. I trashed one SanSan, but at the end we were both one agenda away from winning but he controlled R&D, had 2 installed SanSan (unrezzed) and Biotic in hand. I tried to get lucky by hitting R&D and HQ as often as possible to close the available window for him to score, but I didn’t have the economic advantage and he took it down. As HB, I had a good start and my deck functioned as it should have. I just couldn’t keep up with Kati Jones and Underworld Contacts. While he was building up his suite of Anarch breakers and Datasucker, I was able to fast advance up to 5 points but was a sitting duck after that just waiting to lose. I’m sure Anthony could do a better job filling in the finer points. My round 4 opponent is Matt I. Matt has two 6-0 prestige wins and a 5-1 win coming into this round. I’m thinking that I can probably get 4 prestige from this match, but disappointed that I won’t have enough for top8. Beyond that, I have no recollection of what happened in this match. I asked Jeremy to send me information about my opponents, and according to what he sent me I had 20 match points to his 4, so apparently it was a savage beating. Way to go, past me. I made it! Now I get a playmat and some click trackers and to get beat up by the Woodinville guys! My quarterfinal opponent is Anthony G. Anthony has been at tournaments that I have played in before, but thanks to the work of other fine netrunners, I have not had to play him on my final path to victory in the top8. In the two matches I had played against him previously in the swiss rounds of other events, the matches have been close but I have ultimately lost. Now he runs a fine website dedicated to the latest and greatest Android: Netrunner content. Anthony is playing Andromeda/HB, quite close to Anthony R’s lists from Round 3. This does not bode well, as I have lost to this player in the past and his decks earlier this very day. Oh well. I ask him if he will sell me the acrylic core set IDs that he will obviously win. He says yes. I am pleased. What followed were the closest games of Netrunner I’ve ever played. I open as corp. On my turn, I open with a standard ice, ice, Hedge Fund. He opens with Sure Gamble, Access to Globalsec, and 2 Underworld Contacts. That turn was Just Fine in my book. Despite that, neither of us could stand on an advantage for longer than a 2 turn cycle, we were both alternating rich and poor, and I was able to jam through 6 points worth of agendas. Eventually I succumb to sheer economic stress and he gets control of R&D with two Interfaces. I am not long for this world, and he finds 7 points in my deck. In the Gabe game, he gets his economy going early and spins up 2 early remotes after defending centrals. With Biotic Labor and Archived Memories pumping agendas through a rezzed SanSan, he gets to 6 points. I have 5 points. The game then hits an absurd impasse. He has the tools to win in hand, but doesn’t have the agenda to power through. At some point he hits Accelerated Beta Test, goes for it, and hits Tollbooth, Rototurret, and Wall of Static. I have been hitting R&D hard, scraping enough credits together to barely make it for every 3 out of 4 turns. Fortunately for me, on each of the turns that I miss getting in, he doesn’t draw it off of the top. Eventually, he is down to three cards left in his deck. If he draws the agenda, he wins. He draws, doesn’t have the win, and passes the turn after gaining credits. I run R&D, 50/50 shot, and I see Adonis. I slump. Then I do the math. I have enough to trash and run again! There’s the last agenda, and I take it home 7-6. He reveals the contents of the turn 2 server he installed and I was turned away from by strong ice, Priority Requisition. He played it for the rest of the game like an Eve Campaign and had me dead to rights on assuming it was not an agenda. The games wind up 6-7. 7-6. We both think this means that there is going to be a game 3. This doesn’t seem good for the home team, as neither of those games were convincing victories for me. I take this opportunity to take a break and wander over to the bathroom. When I get back, I ask how we figure out who plays what role in the tiebreaker game. Anthony says “no man, you win.” I don’t understand, why would he concede at this point? He explains to me that the FFG rules say that, in an elimination round, ties are broken by seed out of the swiss. Both of us had equal prestige out of the swiss rounds, and to break that tie, strength of program comes into play. I had played opponents who ended up with higher total prestige, so I advanced. I am really excited to advance, but it doesn’t feel like a very satisfying win. Anthony Roybal 2: Roybal Harder. As I sit down to play his teammate, I ask if Anthony G is ready for The Justice. This time it would be 6-7. 7-6 and I would lose since I was seeded 4th to Roybal’s 1st. It gets a chuckle and we shuffle up to play. I open as Gabe and get 3 Compromised Employee up and running. To keep the early pressure on, I Siphon knowing that he can just shift most of his money to Assets. I do it anyway, to keep him low and to give myself more live targets. I get in with a Siphon and steal his remaining 2 credits to ramp me up 6 (2 from Gabe ID). When I pass the turn, Anthony collects from 2x Adonis and immediately destroys my 3 resources. In fairness, that guy should definitely not still work at that company, he has leaked me so much information over the course of the day. Why do they keep hiring him? I ride my early momentum to 6 points, ultimately losing in the way one expects to lose to HB fast advance, a grinding defeat with the last points scored from hand. Now I know that I have to win my corp game, and I have to keep him to 5 points or less. Oof. My opening is Ice Wall in front of R&D, Viper in front of HQ. He lands early link economy, but no breakers, and continues to dig. I Chum up in front of Viper in front of HQ, feeling pretty good about how taxing it will be to get in and deciding that I can leave an agenda in my hand and not feel vulnerable, at least without a price. When I open my first agenda remote for business, I drop PSF behind Eli and Ichi and spend a click to advance. Unless he’s sitting on Sure Gamble, he doesn’t have enough money and clicks to install a sentry breaker and run through the ice without facing one of the Ichi subs. He has Corroder and 2 link (base and Access). He arrives at the same conclusion, but decides he wants the agenda. When it comes time for the trace, he has 6 credits. I jam it all home and Ichi trace for 9. The damage lands and he gets tagged. My next turn is very similar to his from the previous game and I trash Access and 2 Contacts. He does score the PSF, but things are looking good from here. He shifts his focus to R&D, though luckily does not have any Interfaces installed. I advance Ice Wall to keep him out until he finds Femme and get to work on agendas. He runs afoul of another Ichi trace to get his second 2 pointer, up to two brain damage and down to zero resources. His steady economy never recovers from the loss of his Contacts drip, but he does find Easy Marks and Sure Gambles to get back to a reasonable bankroll. While he was licking his wounds, my deck gave me all of the Adonis and Eve Campaigns and I had worked up to more than 20 credits. I also used the window to score a Beta Test without using the Biotic Labor I had in my hand. It was risky, but I wanted to go into the late game with half of the fast advance combo in my hand to increase my odds. Then I drew False Lead. This was perfect. I could play the False Lead in the remote. Either he would run it, find himself on Ichi’s naughty list again, and ultimately bankrupt himself to get to 5 points, or he would leave it and I would score for the win. He runs the fort, I trace 10 him for the third brain damage, and he gets in, assuming he has the win. He didn’t realize I played 1 pointers, as his version plays Priority Req. The next turn I drew Vitruvius that I Labored out for the win. Meanwhile, on the other side of the bracket, Ian had been tearing it up. It’s late, I’m running on caffeine and disbelief. Ian and I look exasperatedly at each other, not looking forward to another grueling 70 minutes of netrunner that will eventually leave one of us with the loss. I ask him if he wants to concede to me, only half in jest. He thinks for a minute, then says “we’ve played this matchup like a hundred times and we know how it ends” and extends his hand for the handshake. I lose my goddamned mind. Dear reader, pat yourself on the back, champ. This is long, and you read the whole thing. I like netrunner. Ask me questions about stuff. Ian is awesome. Thanks for reading this and the support! ***After this round I went outside to talk to other people who had finished their rounds and share my opinion of “that Conrad kid.” A man I don’t know is milling about very close to us and chimes in that he is Conrad’s dad. It was a funny and slightly embarrassing moment. I meant every word, though!